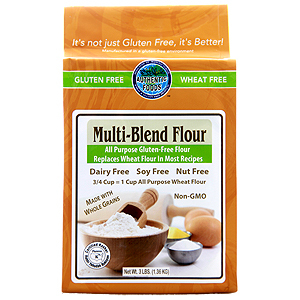 The Authentic Foods Multi-Blend Flour is Non-GMO and one of the best gluten-free all purpose flours. It can be substituted for wheat flour, almost cup for cup (3/4 cup Authentic Foods Multi-Blend Flour = 1 cup wheat flour). When using this flour, there is no need to add additional xanthan gum because the mixture already contains xanthan gum! We want to emphasize how this flour is really unlike any gluten-free flour out there. When you bake with this flour, your baked goods will come out moist and without any grittiness. This flour isn’t just your average gluten-free flour, it is MUCH better! Baked goods with this flour will taste better if not the same as a baked good that contains wheat flour! Preheat oven to 350 degrees Fahrenheit. Grease a flat cookie sheet. Set aside. In a large mixing bowl, combine Authentic Foods Multi-Blend Flour, baking powder, granulated sugar, and salt. Using an electric mixer, slowly add the butter. Mix about 3-4 minutes, until the mixture has a course crumb consistency. Combine the egg white and the cream of tartar. Beat until the cream of tartar is well incorporated and the mixture is full of bubbles. Then mix in the milk, whipping cream, oil, and water. Slowly add the wet ingredients into the dry ingredients. Beat until fully combined, about1 minute. Make balls from the dough using a spoon, ice cream scooper,or your hands, and place on the greased cookie sheet. Pat them flat a little bit to make the shape of a biscuit. Bake for 10-15 minutes until the color of each biscuit is a golden brown. Enjoy with a Southern meal, for breakfast or for an anytime snack!